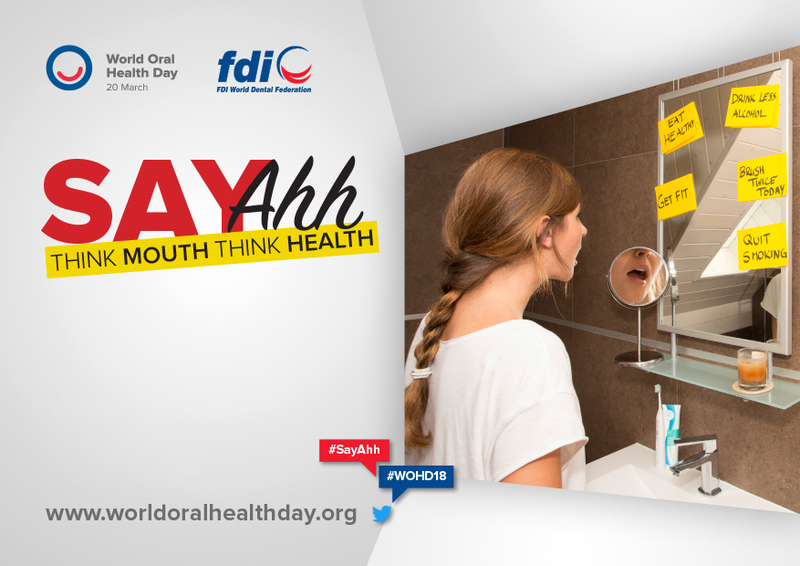 Whether you’re at the doctors or dentist, you may be instructed to say “ahh” on World Oral Health Day 2018. Sure, they’re checking your tonsils and the back of your mouth, but did you know they’re assessing your overall health by just looking inside your mouth? It’s true! Your oral health is linked to your systemic health! World Oral Health Day is adopted for March 20th. The intent of World Oral Health Day is to promote healthy mouths and maintain proper general health and well-being. There are many customs you can perform in order to achieve said goals such as visiting the dentist regularly for your cleaning/checkup appointments, practicing good oral hygiene at home, and being mindful of what you feed your mouths. You should be visiting your dentist every 6 months for a thorough exam and cleaning. Your teeth will be rid of the hard calculus stuck onto the surfaces and in between your teeth as well as being polished for stain removal and that nice shine! Necessary x-rays will be taken and evaluated for Dr. Co to make the proper diagnosis of the condition of your teeth. Outside of your routine examinations, you have your obligations to practice proper oral hygiene at home. Plaque forms within minutes of eating, therefore, it is important to brush every morning and evening and floss at least once a day to disturb plaque and potential calculus formation. In addition to how you take care of your mouth, keep in mind that what you put in it matters as well. Having a poor diet increases the risk of oral diseases such as cavities. To prevent this, avoid foods high in sugars and starches because they hide in all the grooves of your teeth throughout the day and refrain from snacking too frequently in between meals because that provides the proper pH in your mouths to encourage bacterial growth and decay. Smoking and alcohol consumption are also risk factors for gum disease, bone loss, dry mouth, bad breath, and decay. Remember your body and mouth are linked, so if you feed it poorly, it will show!